When you marry a man in the military, you can expect to do a little moving. That happened every four years for Christie Kotz of The Peach Peddler. 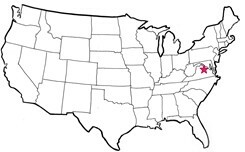 With her husband, Jeffrey, who she	deems	as	the	"brains" of her company, Christie moved all over the United States and now currently resides in Falls Church, Virginia. "I was born in Macon, Georgia, known for its peaches, and they became the inspiration for the name	The Peach Peddler." In Virginia the couple raise their four children while her bear making business got underway. With her husband by her side, who handles the operations, technical issues and things such as copper wiring of armatures, Christie dedicates herself to bringing to life her wonderful bears. Throughout Christie's life, bears have been front and center. "Each night, I would put the creepy porcelain doll from my grandmother in the far back corner of my closet, and station a group of stuffed animals as sentinels to keep the doll from coming to get me while I slept. The rest of my stuffed animals lined the perimeter of my bed, to keep the monster under the bed from reaching over the edge to get me." With her bears on active watch (because they were braver than she felt she could be), Christie gave into her slightly over-active imagination and her love for teddy bears was solidified. After two childhood accidents, which left Christie physically injured, she learned to lean on her bears for love and support. 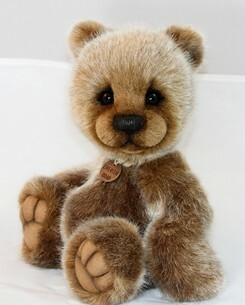 "My favorite childhood bear was a potbellied brown bear. I loved the fur right off of that bear! My mother sewed him back together for me, time and again, until he was more patchwork than bear." "Throughout my childhood, my bears and my older brother Lee were my constant companions. However, my bears weren’t nearly as bossy as my brother, and they didn’t eat all of the red candies on our walks to the store; so I liked my bears much better than I liked Lee." When Jeffrey and Christie were stationed in Los Angeles, California, a friend of hers told her about an auction. It was then that Christie first learned of "artist bears." I could have imagined, with hand-painted detailed eyes, shading, amazing fur, and a soulful expressions they looked so alive." The bears brought back all the nostalgia of her childhood. The auctioning price of the bear brought her back to earth. "The bid price quickly soared far beyond what I could afford to pay at the time. 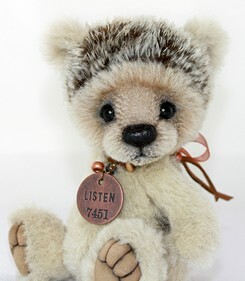 Having only seen teddy bears on shelves in stores, I was not prepared for the bid price that an artist bear could command." She sank into a momentary depression and her husband took a tough love approach. He suggested that she stop moaning about the one she didn't get and learn to make bears for herself. "How hard could it be?" she thought. With her husband's insistence that anything could be learned, Christie set off to create her own bears. If for no other reason than to possibly sell some to afford to buy the bears by the artist she had been so impressed by. In the following weeks, Christie submerged herself into learning how to make bears, with all the features that she so enjoyed herself. With teddy bear artists always being the most helpful, friendly and supportive people, she learned how to accomplish all those tasks. I had anticipated from such a talented group. I think almost all of us are collectors as well as artists. 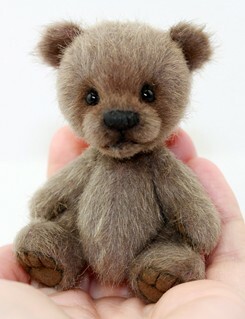 In my opinion, this world could never have enough teddy bears or bear artists." As luck would have it, Edinburgh Imports was just a stone's throw from where she lived. With so many fabric choices, her education in bear making flourished. With encouragement along the way by family, friends and people in the trade, Christie found her niche. I tell anyone starting out that they should give themselves ten ugly bears before they allow themselves to give up on being a bear artist. Because by the time you’ve made ten bears, you will understand how and know why certain steps are taken, and you will start seeing your own style emerge. I still have my first bear on a shelf, and he keeps me humble." "If I don’t start to fall in love with a bear I’m creating, I won’t finish it. When the bear’s face starts to emerge from the fur trimming, I start feeling that familiar tug at my heart and I start to feel a personality emerging from the process. By the time I’ve finished the body, I’m usually head-over-heels in love, and struggling to convince myself to sell the bear. If I do not experience that struggle around the bear’s completion, I would not feel good about selling the bear. 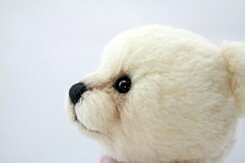 He has to be good enough that I will feel just a bit sad when I’m packing him up to travel to his new home." 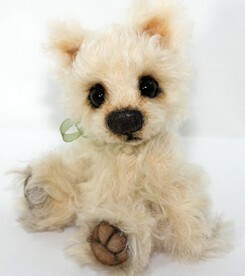 Christie has won several awards and sells her bears on her web site and through Bearpile. 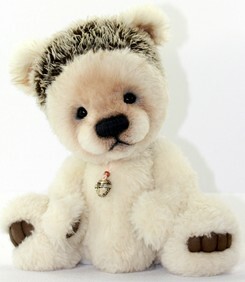 "If I had one wish for my bear making," Christie adds, "it would be that I could bring teddy-bears back to life for other “grown ups”, to help them rekindle that essence of childhood; the part that reminds us that the world is still full of magic and that feeling safe and loved is as easy as squeezing a little bear tightly." Collectors - if you like reading articles like this, why not subscribe to Bears&Buds? Just $15.00 a year. You'll receive a collector's lapel pin and a password to enter the Collectors' page where you'll find more wonderful articles..